I like to make and prepare all the foods we eat for our meals, but let's be honest...there are some days I just don't have the time of ambition to cut, dice, prepare and cook all the parts of our meal! So I have a few trusted brands I turn to for their easy to make but still really healthy frozen foods that I can quickly heat up! Alexia is one of those companies that has my trust because of their an all-natural and organic line of frozen side-dishes that make for the perfect addition to any meal, and please everyone at the dinner table. Ready to eat in about 20 minutes, they’re also perfect as a mid-day snack and go well with any of your favorite recipes! Mozzarella Stix with Olive Oil & Italian Herbs: Combining the delicious flavor of savory mozzarella cheese with classic Italian herbs and olive oil for a new Old World taste. Mozzarella Sticks are one of my guilty pleasures - I love the oogey gooey cheese and now they don't have to be that guilty of a pleasure! I love that I know every ingredient on the list and they don't have any icky ingredients that I wouldn't normally eat! Organic Yukon Select Fries: Lightly seasoned with sea salt, these Julienne Fries make your everyday French fry wonder where it went wrong. Organic Oven Crinkles with Sea Salt & Pepper: Pacific Northwest Russet Potatoes deliciously seasoned with sea salt & cracked black pepper combine perfectly to bring out savory potato flavor like never before. These are also great as a side dish when grilling, baking, or as a snack! Also, make sure you sign up to be part of the Alexia Ambassador Program for exclusive recipes, coupons, free gift cards and kitchen gear. 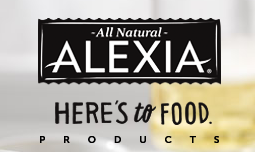 Buy It: You can purchase all Alexia foods at a local retailer near you!